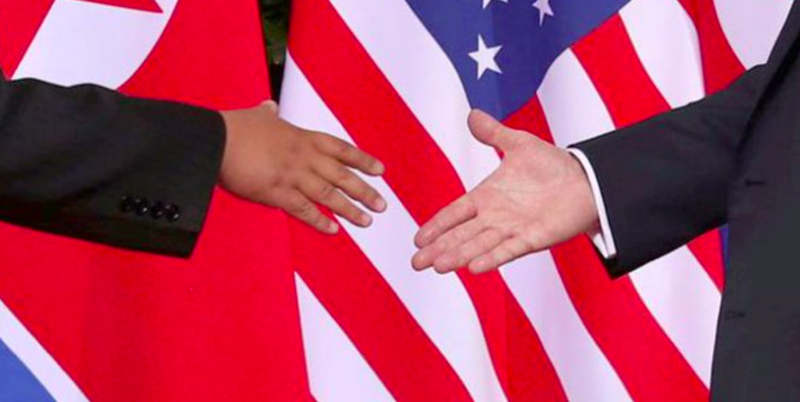 Trump and Kim go in for a handshake following their summit in Singapore today. Picture via Twitter. What is your Source for the The General Sherman Incident (1866) because what you wrote is not correct. This is what happened. Source is provided. Korean leaders were aware that China’s position had been transformed by the arrival of powerful Western gunboats and traders, but they reacted to the Opium War (1839-42) between China and Britain by shutting Korea’s doors even tighter. In 1853 United States Navy Commodore Matthew C. Perry and his “black ships” entered Edo Bay, beginning the process of opening Japan to foreign trade. Korea, however, continued its isolationist policy. Japan’s drastic reform of its institutions — the Meiji Restoration of 1868 — and subsequent industrialization was attributed by Korean literati to Japan’s alleged inferior grasp of Confucian doctrine. Through its successful rebuff of French and American attempts to “open” Korea, the regime was encouraged to think it could hold out indefinitely against external pressure. In late 1865 the US Navy gunship Princess Royal, an armed American merchant-marine schooner and formerly a Confederate blockade runner, was dispatched to China to help protect the US interests in China. The American merchant W.B. Preston arranged with the Meadows & Co., a British firm in Tientsin, to send the ship [renamed the SS General Sherman – SS = Steam Ship, not USS = United States Ship] to Korea. The SS General Sherman steamed up the Taedong River almost to P’yongyang. In August 1866 the General Sherman became stranded in the river. Shortly thereafter, the Korean governor ordered his troops to attack. The Koreans burned the ship by the use of a fire raft and when the ship’s crew reached shore, they were massacred. Other foreigners, including French missionaries, had suffered the same fate at different times. Kim Il Sung claimed that his great-grandfather was involved in this incident. Historical fabrications in the North go so far as to portray Kim Il Sung’s great grandfather Kim Ung-u as a brave fighter against the “U.S. imperialists,” maintaining that he destroyed the USS General Sherman, and that Korean anti-American struggles began as early as the 1880s. Kim’s father Kim Hyong-jik and his mother Kang Ban-sok are depicted as “indefatigable fighters” who led the anti-Japanese civilian movement of “March 1, 1919,” which are historical fabrications. What is your reference for The Shinmiyango (1871) ? Your comments are not correct. On June 1, the American ships entered the Ganghwa Straits on the west coast of Korea. Their goal was to steam up the Han River, which led to the capital city of Hanyang (modern day Seoul). The Korean king, however, had barred foreign ships from entering the Han. So when the American ships passed by, the Korean garrison onshore fired. Their outdated weapons did no damage, but that didn’t matter to Admiral Rogers. He gave the Koreans ten days to apologize for what he regarded as an unprovoked assault. The Koreans refused to comply. So Admiral Rogers made good on his threat. On June 10, the U.S. ships attacked the Choji Garrison on the island of Ganghwa-do. It was a mismatch from the start. The garrison was lightly defended, poorly equipped, and badly outnumbered. U.S. marines and sailors then went on to overrun several other Korean posts on the island. When the smoke cleared at the end of the day, the Americans controlled Ganghwa-do at the cost of three dead. The Koreans weren’t so fortunate. They lost more than two-hundred-and-forty men. Koreans call the fighting on Ganghwa-do “Shinmiyangyo,” which literally means “Western Disturbance in the Shinmi Year.” The American victory marked the first time that the stars and stripes were raised over Asian territory by force. Fifteen Americans—nine sailors and six marines—earned Medals of Honor for their bravery during the campaign, making them the first Medal of Honor recipients to be honored for fighting on foreign soil.